Hey, I had the craziest idea. What if we made a movie based on a young adult book, or no, better, made it about vampires. Original, right? It’s not like they aren’t all over the place already on TV and in the movies – it’ll be grand. Okay, to be fair, Vampire Academy has some things going for it that did actually impress me, but for the most part it was Twilight meets Harry Potter. I was with the story itself until I actually watched it and was attempting to follow the story…yikes. I’m going to try to be frank with you on the plot progression. Let’s see. There are vampires in the world, with three classifications. I don’t remember their scientific names, so we’ll just go with the good vampires, bad vampires, and the half-breed vampires that are protectors of the good vampires. The good ones have powers that control things like, air water and fire. They are mortal and some actively participate in the taboo of feeding off of the protector vampires. Anyways, the main character is Rose Hathaway, and her main objective is to keep Lissa safe, the good vampire for which she has a “bond” with. Every now and again she can see through Lissa’s eyes. It’s weird. They go to this Vampire Academy, so to speak, which is basically Hogwarts. You got your half-breed main character (muggle Harry Potter), you got powers training, heck you even have a character that’s just like Draco Malfoy. You know what, I’m not even going to complain because I like Harry Potter, and imitation is flattering, right? The fact is, the story was all over the place. So much so that I couldn’t follow it very much, other than what I wrote for the plot description. So much was happening, and people were talking so fast and obnoxious like…it started to become tedious to even watch the thing. When you have a film that goes through so much, you need some good transitions in order for the audience to actually follow along with the story. Instead, it’s “Let’s do this, let’s do that! Let’s go here, let’s go there! Now let’s do this and that and this and that and this and…” here’s an idea – let’s not!! Does a film really need a billion things happening all at once with little explanation? You may be still thinking about what happened in one scene two to three scenes later. Then, there’s multiple scenes that feel like endings…it’s just all over the place. You guys, you guys…read the book instead. I haven’t, but I have a feeling it’s written in a way that you actually can understand. Now, like I said there were moments in the film that did impress me, which is why I didn’t rate this film really low. First of all, the humor. It wasn’t amazing, but they did have a good sense of humor when it came to sarcasm and self-aware comedy. It makes fun of Twilight and other vampire-centered TV shows – which actually does a decent job at separating it as its own thing. That is good. Not only that, but the characters and their interactions with each other, for the most part, are absolutely great. Some of the characters I don’t care for, including the one that has a hard-to-understand accent, but Lissa and Rose are very good characters with very good chemistry. Wouldn’t surprise me at all if that is what the book series hangs on. 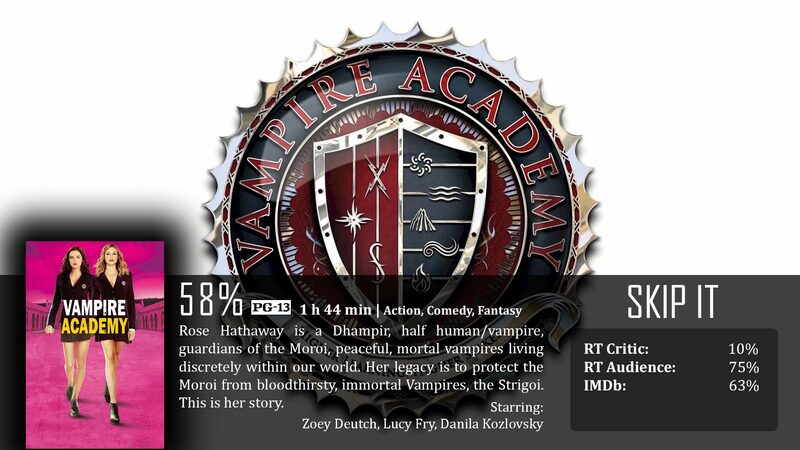 For the most part, Vampire Academy does a good job at portraying sarcasm and self-aware comedy – separating it from other vampire films and tv shows. It also has great chemistry from the two leads – Lissa and Rose. Try to watch this film and actually understand everything. I swear someone in the editing room literally put it on fast-forward, because these guys were talking really quickly without any breaks to breathe. I may be over-reacting, but they just wouldn’t shut up. Ever hear of a dramatic pause? Ever hear of story development? Scene after scene gets a little old when you don’t give the scenes any time to develop anything of importance. They are just…there. Rose Hathaway: A female – especially one who lives off of blood and magic – is going to have her mood swings. Hey, that one chick kinda does look like Draco Malfoy, doesn’t she? Well thank you much, Angie, and you’re right to stay away from Vampire films and tv shows. Variety is of utmost importance, and even though this had a little bit of variety, it just wasn’t enough to wash away the overcrowded plotlines and dialogue vomit that the rest of the film had.